"It is with the deepest regret that we have to inform you of the death of our dear friend and highly valued colleague, Paul Spragg. All of us here at Big Finish feel utterly devastated by the news. Paul had worked with us for over five years and had become an essential member of the team. We will remember him for his tireless diligence, his total dedication to his job, his cheery nature, his hilarious sense of humour and his kindness and friendship. Our listeners will perhaps know him best for his BF forum contributions, all the help he gave customers via the enquires@bigfinish address and his many, many podcast appearances. He had relatively recently become editor of Vortex magazine (a promotion he was given 'live' on a podcast). His work behind the scenes on contracts, script distribution, proof-reading, cover layout, studio management, CD Extra interviews, the website and so much more made him vital to the company's operations. Paul's partner, Natalie Hayden, issued a statement on Facebook today. Our thoughts are with Natalie, who made Paul so happy, and all his family and close friends. We intend to celebrate and honour Paul's memory. For now, we are in the most terrible shock." There's been several obituaries. Cavan Scott wrote "The sad, sad news of the passing of Paul Spragg, one of the nicest men I’ve ever worked with. RIP Paul" and dedicated his latest Blake's 7 audio "Cold Fury" to him here. Tom Spilsbury: "My oldest and most loyal friend, Paul Spragg, has died. The kindest man in the world. We were best mates for 27 years. I am bereft." He wrote a longer tribute about their long friendship here. Artron Reviews has a thoughtful piece too. Many Doctor Who fans expressed their condolences on Twitter. In the interests of archiving some of these before they become unfindable, here's a few...Gary Russell: "There're few people in the world that noone has a bad word for. Paul Spragg was one of them. To say he'll be missed is an understatement." Jonathan Morris: "Ridiculously sad, stupid and horrible news. Lovely Paul Spragg. RIP." Toby Hadoke: "Tragic news, lovely man. He got Who's Round online (among the many other duties he carried out cheerfully/diligently)". Joseph Lidster: "One of the nicest, most helpful guys I’ve ever worked with. Can’t quite believe it. Much love to his family x". Nicholas Pegg: "Shocked to hear of the sudden death of bigfinish stalwart Paul Spragg. A terrible loss to his family, his partner, and his many friends." 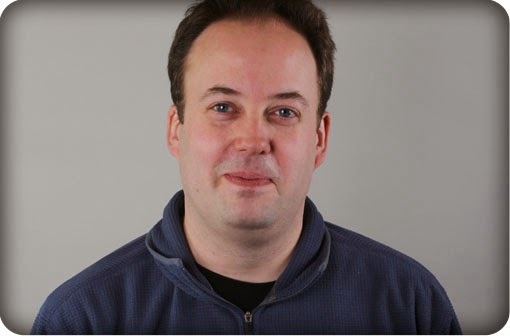 Paul Cornell: "I'm terribly sorry to hear of the death of Paul Spragg. That's a terrible blow to the bigfinish family." Barnaby Edwards: "Just heard the dreadful news about Paul Spragg. A dedicated @bigfinish colleague and a lovely, funny man who will be sorely missed by all." Clayton Hickman: "Horribly sad to hear we've lost Paul Spragg. He was so kind to me during my first year in London when we both worked at VI. Lovely guy." Katy Manning: "so sad to hear Paul Spragg has gone on his awfully big adventure so young ! know he'll b missed x". James Moran: "Oh god, just saw that Paul Spragg of @bigfinish died suddenly. Lovely, talented gent, that's so sad". Terry Molloy: "So deeply shocked to hear the news about Paul Spragg My sympathy to his family and his @bigfinish colleagues too." And lots of other fans expressed similar sentiments. Hi, Dorothy. It's Dave from Artron. Thank you very much for including a link to my piece amongst all the other far superior tributes. A star really has gone out.